Theme Parking: What Should Disney Do With One Billion Dollars? Ban Selfie Sticks! If you didn't see my update to yesterday's post, it turns out that my predication of a selfie stick ban was exceptionally timely. Within hours of that post1, Disney announced a ban on all selfie sticks inside their American parks starting June 30 and on their international properties July 1. Sorry to every selfie stick user who isn't a terrible person; the terrible people spoiled it for you. My wife and I already offer to take pictures of people awkwardly trying to selfie their families. If you find us in the park, we will be more than happy to do the same for you. The other big news from yesterday was the announcement of a potential one billion dollar expansion of the Disneyland Resort and surroundings. Today, The Orange County Register posted an excellent breakdown of expansion options for the parks. It covers both intellectual properties they are likely to build on as well as areas of the property that are available for construction and remodeling. As packed as the Resort is, it is nice to know that the parks still have room to grow. Footnote 1: Four hours to be exact. Theme Parking: A Billion Dollar Expansion, Rising Prices.... and Selfie Sticks? As I like to do with gaming news, I wanted to round up a few news items about Disneyland that may not deserve in individual post. Such is the power of the bullet point. There is likely no better source for Disneyland News than The Orange County Register.1 Since the parks sit firmly within its jurisdiction, the newspaper has a vested interest in covering Disneyland as a local concern. So when news breaks, the Register's Disney section is likely to cover it first. Such was the case with the news today. Staff writers Art Marroquin and Joseph Pimentel revealed that Walt Disney Co. is considering a $1 billion dollar expansion to Disneyland and California Adventure. With construction beginning in 2017, those plans include new attractions, a new parking structure, and improvements to the surrounding city streets, but not a third park. However, those plans are contingent on Anaheim extending current tax exemptions on park admissions. Considering how much a billion dollars was able to improve California Adventure, I would love to see what more they can do for the resort. Republished on the OC Register site, Drew Harwell's Washington Post story titled "How theme parks like Disney World left the middle class behind" examines the effects of rising prices have on what was once a park for everyone. I know that our family is only able to afford annual passes this year because we have restructured our finances to allow it. I understand that the value I place Disneyland is skewed, but I can't imagine how anyone can manage to take their family without considerable planning and savings. One only has to look at the massive crowds to know that high prices aren't keeping people away. But I wish there was something that could be done to let more people experience Disneyland affordably. 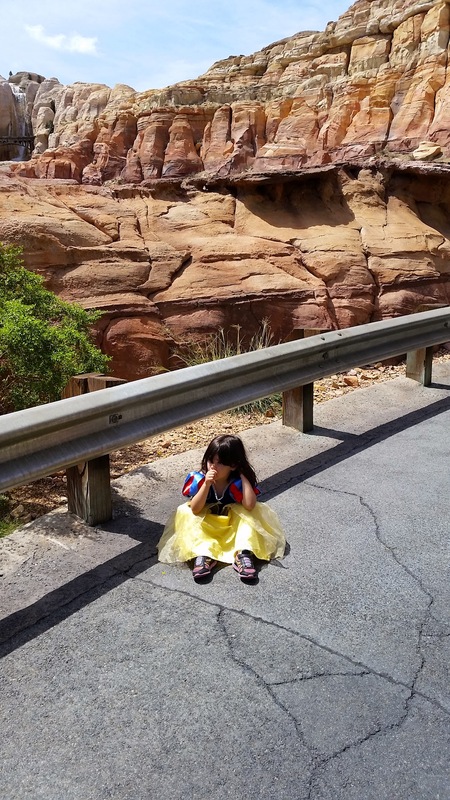 MousePlanet, my favorite blog for Disney park news, posted a follow up to their study of posted wait times at Walt Disney World, this time focusing on wait time at the Disneyland Resort. In comparison to its sister resort in Florida, wait times at Disneyland and California Adventure are a lot more accurate. Usually, actual wait times will be about 80% of the posted time, though shorter posted times seem to be underestimations. I'm a sucker for fun statistics like this. Finally, The OC Register posted an article about a recent stoppage on the California Screamin' rollercoaster. 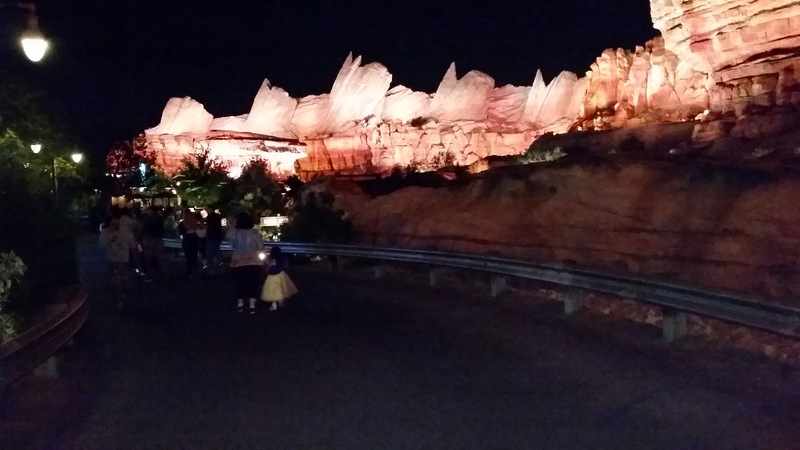 The two hour stop was caused by a passenger extending a selfie stick while the ride was in progress. I get that someone might have a narcissistic need to document their life for all of their Facebook or Instagram friends. I get that a specialized device might be helpful to make those photos seem slightly less unnatural. But what I don't get is this blatant disregard for the safety of their fellow park guests, if not their own safety. I don't know how many times I've heard warnings broadcast by cast members to parents who are too negligent to keep their children seated on what could be a dangerous ride. There are some rides that I have never experienced without at least one warning. Why do people have to be so stupid? Arrgh! Anyway, watch here for the inevitable selfie stick ban. Footnote 1: Actually, there probably is a better source for Disneyland news out there, but I haven't found it yet. Bethesda - Far and away, the star of Bethesda's inaugural conference was Fallout 4. Considering the amount of time they dedicated to it, I'm sure Bethesda felt the same way. I don't have any special love for their games (I never got very far in Fallout 3 or Skyrim), but they sure make Fallout 4 look great. Microsoft - Though not a game, the biggest surprise for the Xbox One was the announcement of Backward Compatibility with Xbox 360 games. I actually enjoyed the Xbox to Xbox 360 compatibility, so I was happy to see that feature come to the new console. If I had not already thrown in my lot with the PS4, the lower price and this announcement would have swayed me Microsoft's way. The most interesting game at the conference was Sea of Thieves, Rare's new pirate themed game. It seems to fill that long time dream of letting multiple people crew a ship together and take to the sea. And just like last year, Cuphead looks amazing. I hope it finds its way to PC because I would love to see that game in person. I might have put the Elite Controller on this list were it not for the $150 price tag. Yow. EA - Were it not for Giant Bomb streaming the EA conference, I would have turned it off half way through. The only game of note was Mass Effect: Andromeda, and even that was just a teaser. A pretty cool teaser, but that's all I took away from the conference. Ubisoft - I never did play The Stick Of Truth (even though I still mean to) but I couldn't help my excitement over the sequel, South Park: The Fractured But Whole. And if you get a laugh out of the Trials Fusion Awesome Level Max, you might want to check your pulse; you're probably dead. Sony - As a PlayStation 4 owner, I watched the Sony conference with an extra helping of self-interest. Campo Santo's Firewatch continues to take shape. I pretty much know that I want to try it out, but I'm glad to have a great idea about what to expect. The surprise of the conference was Horizon: Zero Dawn. The robot dinosaur hunting game looked great and felt unique. I will have to see more before taking a chance on the game, but I am eager to see more. As a Destiny player, I was happy to see the announcement of The Taken King. As always, I am wary of the value proposition of their products. Finally, I was happy to see DLNA support added to the PS4. If we ever get a remote control for the console, I will be able to put my Xbox 360 away entirely. Nintendo - First, if you haven't watched the Nintendo Direct from this E3, go do it now! The Muppet Nintendo characters are amazing. For games, I'm primarily interested in Super Mario Maker. I'll be interested to see just how powerful a tool it ends up being. However since I don't own a Wii U but do own a 3DS, I'm more likely to buy Yo-Kai Watch. I've heard so much about the popularity of the game in Japan that my curiosity meter has red lined. Square Enix - Maybe it's better not to say anything about this one. What did you think of E3? What are you looking forward to playing in the coming year(s)? How is this for a reversal? Does that read to anyone else like a very slightly tweaked version of the status quo? Anyway, if you love flying in World of Warcraft, this is very good news. I was under the mistaken impression that Disney didn't make rides like this any more. For several years, it looks like Disney was only interested in thrill rides and more active experiences. Rides like Roger Rabbit's Car Toon Spin, Indiana Jones Adventure, and Buzz Lightyear Astro Blasters showed that Imagineering was interested in building something more than the standard dark ride. The Fantasyland dark rides finally received a modern take in 2003 with the opening of The Many Adventures of Winnie the Pooh. But grander rides on the scale of Pirates of the Caribbean and the Haunted Mansion were unique for decades. Actually, let me stop for a moment to talk about this beautiful poster. I love Disney's attraction posters. We have several hanging in our home. 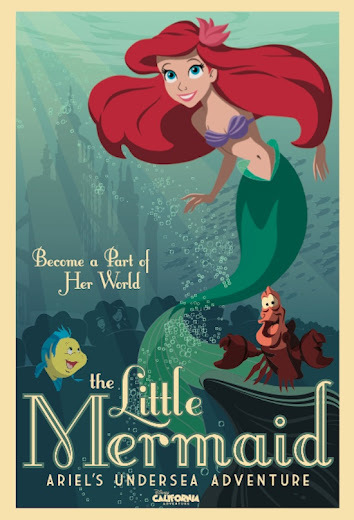 This poster, like many of the DCA posters by artist Greg Maletic, is thoroughly modern while invoking the styles of Disney artists of the past. It is simultaneously reverent and refreshing, much like the park it advertises. I'm so happy that Disney made that choice when commissioning the new posters. 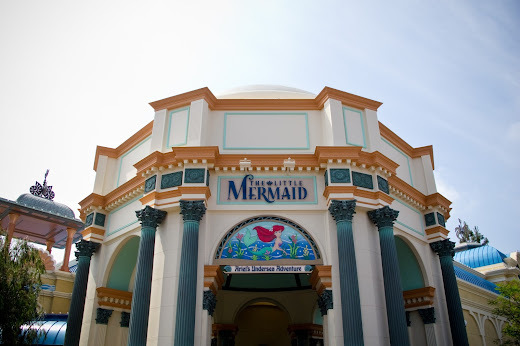 From the outside, Ariel's Undersea Adventure resembles an old-fashioned aquarium, one you might visit while on vacation at the seaside. Inside, you climb into a clamshell vehicle and enter the wreck of Prince Eric's ship. This may be my favorite effect of the ride, where the water and bubbles are projected on the vehicle you are facing as you slide underwater. Above, you spy upon Ariel and Flounder swimming above you. The ride continues through Ariel's grotto, then into the large Under The Sea section. 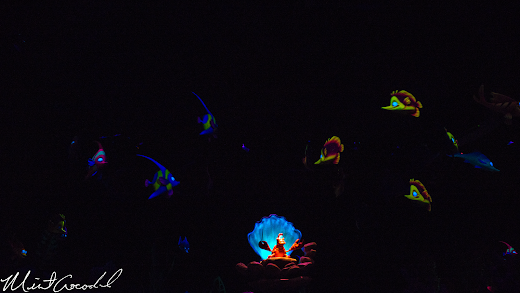 Beyond, you enter Ursula's cavern and witness Ariel's transformation from mermaid to human. 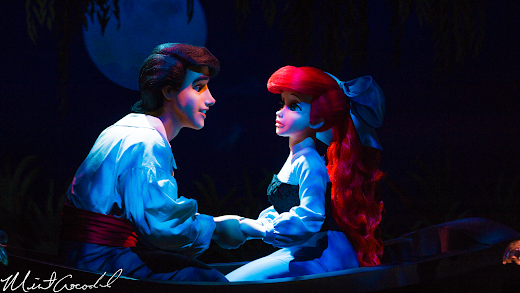 As you climb back to the surface, you witness Prince Eric and Ariel's romantic rowboat outing. Finally, with Ursula defeated, everyone comes out to celebrate the couple's wedding. Sometime in 2012, there was a refurbishment of the ride to improve a number of the effects and models. Although I might have enjoyed witnessing the before and after versions, I'm glad that I got to see the ride in its improved state. Any impression I had that Disney lost the ability to work magic was completely banished by Ariel's Undersea Adventure. I left the ride astonished. As I said at the beginning, I thought that Disney didn't make rides like this any more. The ride, like the poster above and the park they represent, honors the Disney tradition even as it grows beyond the constraints of history. My mental construction of Disneyland takes a few forms. There is the black-and-white 1955 Disneyland based on all of the books and shows I've consumed about the early days of the park. There is the 1980's Disneyland that I remember from my childhood. And there is the 2005 Disneyland, the last time my wife and I took a trip to the park, until recently. That trip was our one experience with Disney's California Adventure (as it was called at the time). It was then that my expectations of DCA were set for the next decade. At the time we visited DCA, it was still in the weird middle phase of the park. The anticipation of a new park adjoining Disneyland has already passed, leaving a crater where all of our hopes had been. Disney Parks and Resorts was already looking for ways to improve DCA, with additions like A Bug's Land and the Tower Of Terror, but had not yet committed to the massive makeover that made the park what it is today. Thus, although DCA would start its turnaround within a couple of years, the last impression the park left in my mind was of a poor substitute for the Magic Kingdom sitting just a few yards away. Even as we returned to the resort in the last couple of years, that prejudice kept us from entering California Adventure again, fearing it would be a waste of money. But then I bought Poster Art Of The Disney Parks (review coming soon), the last chapter of which was dedicated to the posters of Disney California Adventure. I told my wife, upon reading the chapter, that the posters seemed to be a lot better than the park deserved. I didn't realize, at the time, that the posters were actually a sign that DCA had improved so much. This year, in possession of annual passes for the first time in fifteen years, we trekked across the esplanade and I fell in love all over again. In the nearly ten years between visits, California Adventure had transformed from a cynical and insincere counterfeit of the state into an idealized, nostalgic version of Walt Disney's California. It finally feels like a match to its sister park. Passing through the gates to Buena Vista Street has a different, but complimentary magic to crossing under the berm onto Main Street. It is a magic that says "This is a world full of possibilities." And I fully expect that the Disneyland Resort will fulfill that promise for years to come. There is so much more to say, but I feel that there is so much more to discover as well. But first and foremost, I'm glad that I have been proven wrong about Disney California Adventure. With the return of my Disneyland obsession, I find my myself seeking out blogs and websites that I haven't been paying attention to over the last ten years. One of the blogs I found was Tom Bricker's Disney Tourist Blog. The post that caught my attention was My Disney Theme Park Library, a list of his accrued books about the Disney parks. 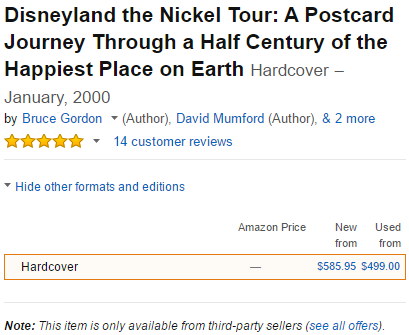 I didn't have to read very far into his Disneyland section before finding Disneyland the Nickel Tour: A Postcard Journey Through a Half Century of the Happiest Place on Earth. His describes it as "[u]nquestionably the best book about Disneyland". A stronger recommendation I could not imagine, so off to the internet I went. A quick Google search turned up this Amazon link. Jiminy Cricket! I guess I should have kept reading his review. About halfway down the paragraph he also writes, "Unfortunately, it’s also rare and incredibly expensive." Tom, you aren't kidding. Here is my plan: I'm Kickstarting the purchase of the book and running the site, then I'm writing off the price as a business expense on my taxes. Bulletproof, right? Maybe not. I console myself with the thought that, as expensive as my hobby can be, it will never be as expensive as it gets for some.